Chalazia (the plural of chalazion) and styes are lumps that form on your eyelids. Chalazia are formed by blocked oil glands, while styes are formed by an infection at the base of an eyelash. They can happen at any age, but are more common in adults. 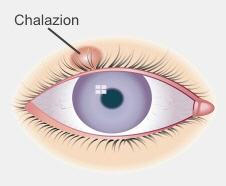 A chalazion is a lump on one of your eyelids. It forms when a tiny oil gland on the inside of your eyelid (also called a meibomian gland) gets blocked and swollen. Oil builds up inside the gland and forms a lump. Eventually the gland may break open and release the oil into the surrounding tissue. This can cause redness and swelling of your eyelid. At first a chalazion is a red, tender, and swollen area but in a few days it changes to a painless, slow-growing lump. Usually chalazia start out very small, but they can grow to the size of a pea. They can make your eye water more, and large chalazia that press against your eye can cause blurred vision and discomfort. Often chalazia will go away by themselves after about a month, without any treatment. A chalazion might also be called a meibomian cyst. Chalazia are often confused with styes. Stye is the name for a lump or swelling that happens when an infection forms around the base of eyelashes, on the edge of your eyelid. A stye causes a painful, red lump or swelling. Styes are caused by bacterial infection of the gland at the base of an eyelash. Styes are usually smaller, painful and closer to the surface of the eyelid than chalazia. They can look like a tiny yellow pus-filled spot. A chalazion can happen as an after-effect of a stye. have a skin condition like acne, rosacea or seborrhoeic dermatitis. To prevent chalazia or styes, it may help to gently clean the eyelash edge of your eyelids each night. Use eye cleansing pads or diluted baby shampoo. You can also put a warm compress on your eye lids for a few minutes each night before bed. And remember to keep your hands clean. On the next page: What can I do about a chalazion or stye?